The Tradinistas (Traditionalist + Sandinista) make up a new “movement” of mostly young Catholics who drank the heady wine of Marx, and believe that his economics is the wave of the future. The attraction is the same that seduces all devotees of the now discredited ideology: the promise of a just society free of material deprivation and exploitation of the weak. Marx, if not yet a saint, should at least be a Father of the Church, if the Tradinistas had their way. And while the ideology of globalism is a threat to community and liberty, Marxist dogma is hardly the solution. Marxism has failed everywhere it has been tried. In many cases it unleashed evils that spilled forth rivers of blood. Yet the attraction doesn’t dim. Why is that? 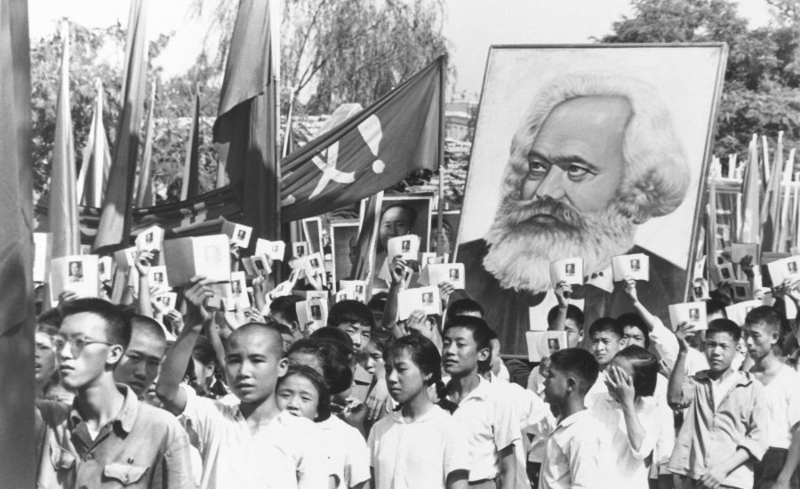 What is it about Marx that holds the minds of men in such paralyzing thrall — in such deep ideological inebriation — that even the voices of those murdered by the violence unleashed time and again by this barbarous ideology cannot penetrate it? That’s a contradiction. The value of the unborn, which the Tradinistas rightly affirm, cannot be reconciled with Marxist dogma. The Tradinistas don’t understand Marx. They don’t see that if they adopt his dogma, the ground for defending the unborn and ultimately all human life will dissolve beneath their feet. The Tradinistas don’t comprehend who Marx was, or that his economics are derived from his desire to stamp out religion and not the other way around. The Tradinistas don’t see the contradiction because they don’t understand the materialist ground (man is matter, no soul exists) of Marxist ideology. They don’t comprehend who Marx was, or that his economics are derived from his desire to stamp out religion and not the other way around. The antidote to their ignorance is found in history, in the words of men wiser than ourselves, who experienced the Marxist horrors firsthand and understood why the promises of Marxist justice are so intoxicating. Religion is the breath of a suppressed creature, the sentiment of the heartless world and, consequently, the spirit of a callous epoch — it is the opium of the people. The annihilation of religion … is the demand for their real happiness. Marx reduces religion and theology to sociology. If there is no room for God — if the memory of God must be eradicated from the cultural memory in order to build the New Jerusalem of the materialist (in fact another Babel) — then any notion of the sacredness of man must be eradicated as well. The Tradinistas don’t understand Marx, but worse, they don’t understand their Christian faith either. Too many Christians are defenseless against the materialist/secular onslaught of the present age that Marx codified, even though the antecedents of materialism lie even further back in history. Such Christians get stuck in paradigmatic thinking, assuming that secularism in just another “world view” in competition with others. They believe that persuasion defeats evil, when what we need is spiritual warfare. The sacramental dimension of the Christian faith reveals that material creation shares in a brokenness, the healing of which only comes from God Himself. The locus of salvation is the Cross and the Cross can only be located in the raw, existential, concrete awareness of one’s own brokenness. Dostoevsky was a master at revealing this inextinguishable truth about human life, especially in Crime and Punishment. This sacramental dimension, this embrace of the Cross in one’s own life, is the means by which the light can penetrate and eventually extinguish the materialist delusion. It is also the way by which the evils unleashed by the mythology of the collective that grows from its acidic soil are defeated. It’s good that the Tradinistas go to church. Presumably they have been baptized and receive the Holy Eucharist. But do they have any understanding of what these sacraments mean? Are they functional atheists? The Tradinista’s defense of the unborn, the only point that stands out against their notions of collective justice, may reveal that an authentic sense of the inviolability of human sacredness indeed remains among them. They are ignorant however of how viciously the Marxist materialism that informs their economic ideas militates against it. If there is no room for God — if the memory of God must be eradicated from the cultural memory in order to build the New Jerusalem of the materialist (in fact another Babel) — then any notion of the sacredness of man must be eradicated as well. So what is the appeal of the false promises of Marxist ideology? Why does it seduce the minds of otherwise bright people and hold them in such paralyzing thrall? The promises of collective justice, the inauguration of the New Jerusalem, the implicit desire to rule others as one of the chosen, all these distortions of soul occur because the whisper first voiced in Eden is heard and believed: You shall be like God. If, God forbid, Tradinista ideas are implemented in the West as they were in the Soviet Union in the last century, some of them will become like prisoners Solzhenitsyn described in The Gulag Archipelago. The Marxists inmates never perceived that the regime was evil. “There must be some mistake!” they cried, certain that Comrade Stalin would free them any day. They went to their deaths believing it. Father Hans, I would also suggest that what we need more if are teachers and leaders who deeply embrace the Incarnation and are able to communicate it’s reality and hope. Unfortunately the ecclesiology of the Catholic Church long ago, IMO, did great violence to the revealed truth that God is everywhere present filling all things. In a greatly reductionist understanding it is not difficult to come to the conclusion that the Pope is the only Catholic. Recognition of His authority is recognition of His and the only way into heaven. That is not the Gospel. The Protestants rightly rebelled against such a spirit. They just went in the direction of antihierarchal individualism which compounded the problem and gave birth to secular egalitarianism and Gnostic materialism. Capitalism as an ideology is little better. Anyone with a heart can see that. It too has rejected the sacred reality of matter in favor of a despotic rapaciousness that looks on everything, including human beings, as capital- a physical resource to be used and exploited until it no longer has quantitative value. In our culture where nothing has intrinsic value, that is inevitable. As you rightly point out, The Cross is essential but the Cross cannot be embraced without knowing that Jesus is fully God and fully man and always will be. His Sacramental presence and the living communion that flows from that is both impossible and inexplicable without the Incarnation. Christ Incarnate and Him crucified at once reveals both the inherent value if all created things while at the same time proclaims the ultimate passing away of all things. I walked out of my church when I was 12 years old in part because the “pastor” was a socialist, and rather than delivering a satisfying and nourishing spiritual message from the pulpit, he subjected his congregation to a Marxist style drubbing of how “bad” we were as human beings, not because of our sinful nature, but because we hadn’t embraced a socialist set of beliefs and engaged in the restructuring of our society along Marxist lines. I still cannot understand why this man chose to be a minister of the gospel if he put all of his true intellectual stock in a bankrupt, godless intellectual construct. All these years later, I still find myself filled with loathing when I think of the minister’s desire to turn his bully pulpit into a cheap soapbox from which he could preach the gospel of Marx, and regale his congregation with homilies about class warfare and the righteousness of a great social leveling (which did NOT include him, however, in his exalted position) which would soon come to pass, in addition to all of the other horrors associated with Socialism/Marxism. I stopped being a Protestant that day, and it has only been recently that I found the Russian Orthodox Church as the fulfilling alternative to my former affiliation. Father, I appreciate so very much (in more ways than one!) your essay on the subject of the nefarious deification of Marx. The idea chills me to my very soul. Christian anthropology lifts man towards Heaven; Marxist anthropology reduces him to dust. There can be no union between the two. The introduction of Marxist principles into Christian communities silences of Christ’s voice through the deceptive manipulation of language and the replacement of God’s promises with materialist substitutes. Hope in the Kingdom and the charity that flows from it are lost, and souls and lives are destroyed in the demonic butcher shop of never-ending revolutionary strife. Very well said, Bill C.